This is something I wrote a while ago and send to my clients whenever they ask about bounce rates. I thought you might find useful too. The bounce rate is a percentage of bounces that occur on pages of your site. A bounce occurs when someone visits your site and leaves without any engagement with the page they land on. Or if they stay on the page but don’t interact with it within 30 minutes, it also counts as a bounce. 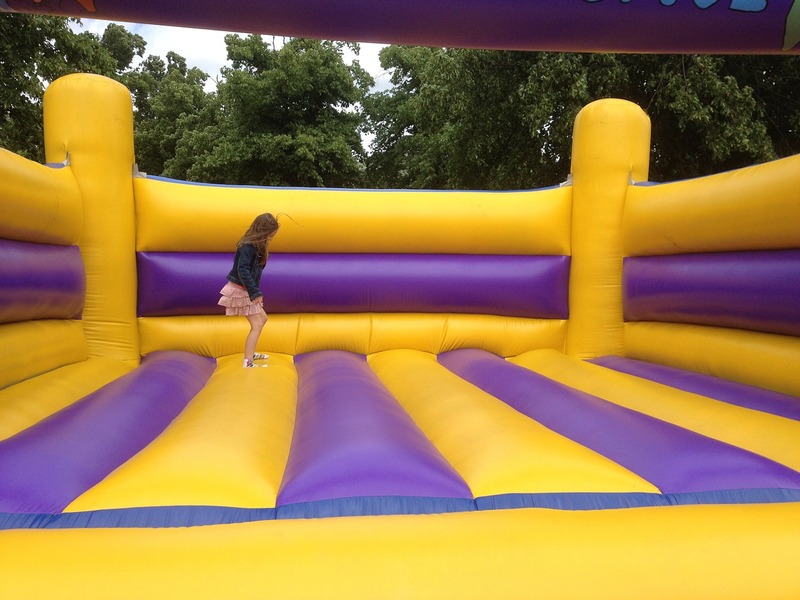 Is Bounce Rate a Good Metric? 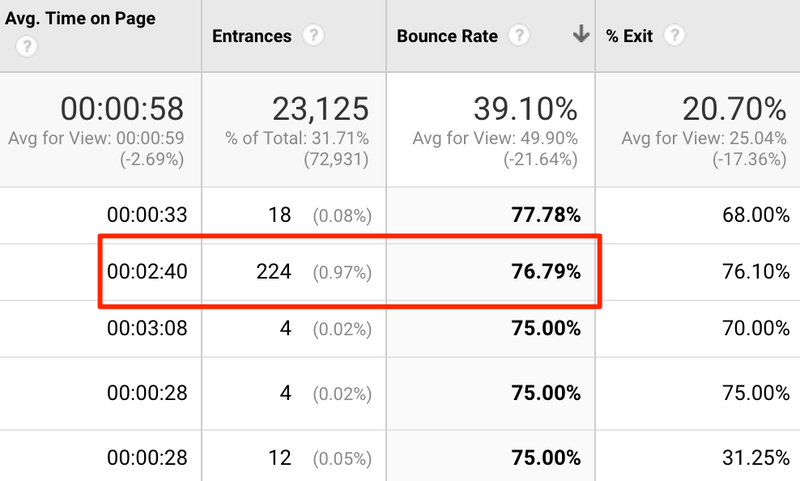 One of the most common mistakes I see people make is looking at overall site bounce rates in Google Analytics. This is a very poor metric because just a few poorly performing pages can totally throw off the numbers. Instead look at related types of pages or individual pages at a time. Also, bounce rates are not always a bad thing. For example, someone may visit a page of your site, find what they need, then leave. For example, they might read an article and learn everything they need to know, they might look at your service page and call you, or they might write your business address down and visit your store in person later. This would be considered a bounce in Google Analytics, but these sessions could result in conversions later, which would obviously be a good thing. Another metric to consider in conjunction with Bounce Rate is Time on Page. If people are leaving a page on your site immediately, there may be an issue. But if people are spending a decent amount of time on the page (however much time it takes to read most of the content), your page has likely provided value to the visitor. If you want to take this analysis to a more advanced level, check out this awesome post from Glenn Gabe on using scroll depth tracking, adjusted bounce rate, and time on page to determine content quality. In regards to blog posts, high bounce rates are common because people read blog posts to learn. This is one of the first steps of the conversion funnel. They may come back again later. There are many ways to improve your bounce rates. Loz James recently interviewed 33 SEO experts and asked them to share their most effective link building strategies. I broke it down into a quick list of strategies for easy reference. I added some notes (in red) and also a few of my own tips at the end. Thought leadership + bios & interviews, for example, speaking, podcasts, online hangouts, etc. 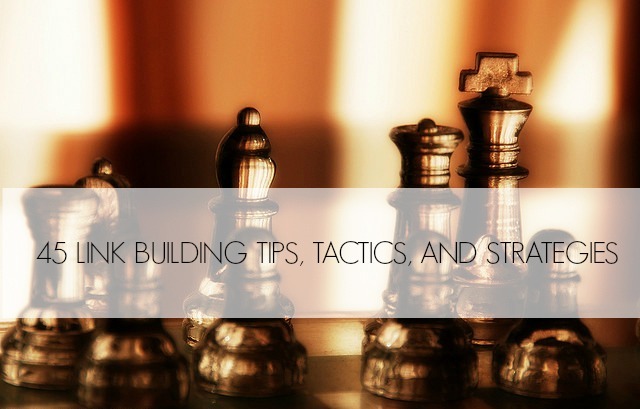 It’s a great list of strategies, but here are a few more I would add. I have a client who was contacted by Written.com, a content syndication company, about syndicating one of their blog posts for a three month period on one of Written.com’s customer’s websites. My client wanted my opinion of content syndication so I gave them some advice based on my own knowledge of the topic. I haven’t syndicated any of my own content, but this is a common question I’ve received over the years, so I’ve done a fair amount of research on it. To start, here are the different types of licenses that Written.com offers. Branded Post License – The article remains on the original publishers website, but the design and branding of the page is changed. The brand is now a sponsor of the page. Syndication License – The brand republishes the article on their site while allowing the original publisher to also keep their article online. The brand will rel=canonical the brand’s page so that search engines don’t see it as duplicate content. 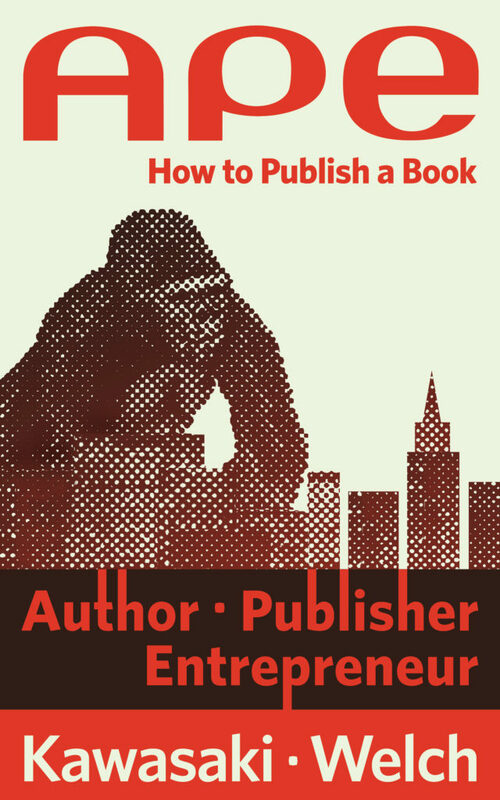 This is probably the worst of all three options because it sends people away from the original publisher’s site. I don’t know if Written.com requires a 301 or a 302 redirect, but I would request a 302 so that the search engines know that the original page is coming back. Another potential issue here is that a random redirect to a different domain can be seen as spam or unnatural link building by the search engines. That’s obviously not what’s happening here, but we don’t know if the search engines can tell the difference. Google might think something shady is happening and could inflict a penalty. The Branded Post License isn’t terrible since the content is still on the original site. Written.com says that the styling around the original article is changed, but in their image example, it looks like they just want to add advertisements to the page. It really depends on how much of the design they change before I can make a decision on this one. If they are completely changing the style of the page, I would say no to this license because it could be jarring for regular readers, but if the only changes are the addition of ads, it’s probably not a bad deal. The SafeSyndication license is the best model in my opinion and one that most online marketers seem to recommend as well. Moz has actually done a Whiteboard Friday on syndicating content and this type of license is exactly what was recommended. Written.com looks like a neat service. I don’t know what they pay, but it’s nice that they offer various options based on the needs of their customers. I was especially surprised to see that they were open and willing to place rel=canonical tags on the republished content. There are some benefits to syndicating content. It’s a great way to get noticed by different audiences in places where you otherwise could have never reached them. It can send new customers and also help build your brand. But if you’re not careful, it can also do just the opposite. If your content is being syndicated on low quality sites or if the proper precautions aren’t taken (such as rel=canonical), you could risk penalties. If you’re thinking about syndicating your content, make sure you know all the details of the agreement before signing the contract. There’s something about writing that feels like an art to me. Whether it’s in books, on the web or in a magazine, reading the work of a real pro always captivates me. I wish I could write like that. I think my biggest problems are in the technicalities of writing. I know I’m terrible at sentence structure and paying attention to the rules of writing. I took a few classes when I was in college for writing and I had the hardest time remembering all of the little details; even simple things like pronouns, adjectives and when to use commas. I even wonder if I was right to use the semi-colon in the previous sentence. Ha! I’ve also noticed that sometimes my writing doesn’t sound very natural. I don’t know what to do about that. I don’t have a sophisticated vocabulary either, which I think sometimes limits my ability to write creatively. I don’t mean that I want to use large words, but I wish I could come up with more creative ways to say things. I enjoyed writing in school and I had great grades in all of my English classes from elementary school all the way through college. I rarely had to make corrections on any my papers and my teachers would always compliment me on my papers, whether they were reports or creative works. After finishing college and starting a career in internet marketing, I discovered blogging which is when I decided to create a blog for myself. About a year into writing on the blog, traffic finally started to increase which in turn also resulted in getting a lot more comments. On a post that I worked really hard on, there was one comment specifically that I’ll never forget. The guy basically told me that he liked the information I provided in the article but that I was terrible writer and he hard a hard time just finishing the post. I have to be honest, that really hurt. After hearing this I immediately began to question myself. Why did my teachers in school tell me that I was a good writer when I really wasn’t? I thought that it may be due to the difference in formats. Writing papers in school was dry and technical while writing online seems to require more personality. Or maybe I just forgot how to write because I hadn’t been writing for a couple years. I really don’t know. With the way internet marketing has changed over the years, more specifically the way Google praises high-quality content and penalizes low-quality content, upgrading my writing skills is becoming more and more important. Creating content is becoming a necessary part of my job, but because of my low self-confidence in my writing skills, I prefer not to write for my clients. I’m ok with being judged on my writing skills when I write on my own sites, but I feel like I’m doing a disservice to my clients when I write for their sites. Because of the volume of content that I need produced for my clients, I will always need to hire a writer, but there are times when I wouldn’t mind writing an occasional article. I just don’t have the confidence. Writing for my clients isn’t the only reason I want to become a better writer. I have quite a few hobbies and when I discover something new, I have a habit of creating a blog so that I can talk about something I really enjoy. I would say one of most important reasons for me wanting to be a better writer is because my biggest professional goal in life is to make a living from my own websites, whether it’s from affiliate marketing, advertising or eventually creating something and selling it, such as a training program or an ebook. I want to be in charge of my success and I want the freedom of being able to work from anywhere and to be able to pick up and move if I wanted. But for any my sites to be as successful as I want them to be, I need to be able to create great content. I’ve actually considered going back to school for journalism with an emphasis on magazine-style writing, which I think is my favorite type of writing, but when I talk to friends who have gone to school for journalism, they always tell me that I would be better off taking a writing class instead of wasting my time and money on an all-out journalism degree program. So I guess that leaves me with wondering what to do next. Would it be a waste of my time to go back to school? Or should I take just a few select college courses? Should I take some classes online? Or maybe I shouldn’t take any classes at all and just continue to write on my blogs and learn from writers online. I’ve always wanted to take classes from experienced online writers like the ones offered from Damn Fine Words or Copyblogger because that’s exactly the type of writing I want to do, but I can’t afford it. Although I don’t feel good about my writing skills right now, when I compare my writing to my first year of blogging, I can see a huge improvement. I know I get better as the years go on, so the one certainty is that I’m going to continue writing and honing my skills for the rest of my life.